The Amritsar rural police has booked a Sub-Divisional Officer (SDO) and two Junior Engineers (JEs) of Punjab State Power Corporation Limited (PSPCL), who allegedly connived with a gurdwara management committee head and forged documents to procure power connections in the name of an ex-servicemen. Giving two hoots to traffic norms, a large number of car owners use black films on their windowpanes in the holy city. It is the residents and tourists who find themselves at the receiving end while visiting Shaheed Baba Deep Singh Gurdwara. With shopkeepers encroaching upon the footpaths in front of the gurdwara, there is hardly any space left for pedestrians. Thanks to the advancement in medical sciences, 19-year-old Satnam Singh does not have to keep silent anymore. From a farmer's family with limited resources, Satnam, whose voice sounded that of a female, had confined himself to his home for the past six years. Doctors at ENT department of the SGPC-run Shri Guru Ram Dass Medical College performed thyroplasty surgery on Satnam and gave him a new life. GND University won the overall championship trophy of the International Jhomer Festival held recently in Jaipur. Dr Jagjit Kaur, director of youth welfare, said the university students participated in music theatre, dance, classical and fine arts during the festival. Various leftist students’ associations have decided to continue their protest till the government promises to convert the ancestral house of martyr Madan Lal Dhingra into a memorial. Literature has always been well received in Amritsar. With time literature has undergone makeovers too. But at present, the city lacks prominent English writers, whereas the regional literature is flourishing. Amritsar has always impressed artists. Ravish Kumar, Praveen Saini, Debabrat Roy and Anurag, who are holding their first group show named Art Motion at SG Thakar Singh Art Gallery, are loving every moment in the holy city. They have come from Kolkata, Moradabad and Delhi. The police arrested two members of a robbers’ gang in late night raid and recovered three motorcycles and sharp-edged weapons from them. The case was registered following an inquiry by the Majitha DSP. A complaint in this regard was filed by Justice Ajit Singh Bains (retd), chairman Punjab Human Rights Organisation, an NGO. A case under Sections 420, 467, 468 and 471 of the IPC has been registered at Mattewal police station against the gurdwara head, identified as Sajjan Singh, SDO Shamsher Singh and junior engineers Ashok Kumar and Mukhtiar Singh. However, nobody has been arrested so far. Ironically, it took over two years for the police to complete the inquiry in the case. Members of the PHRO alleged that the inquiry officer deputed by the then district police chief had completed the probe and submitted its report within a week after lodging of complaint in October 2009, but no action was taken under the alleged influence of a political leader of the area. Sarabjit Singh, principal investigator of the organization, said the then DSP Majitha who probed into the complaint, recommended registration of the case against the gurdwara head and PSPCL employees. He alleged that instead of taking any action against the accused on the basis of the inquiry report, the police did not take any action. Now, the case has been registered against the accused after more than two years of the complaint and subsequent inquiry, he said. However, SPS Parmar, district police chief, said during the previous SSP’s tenure, the case had been sent to deputy DA legal for his opinion. “We received the legal opinion in the case only a couple of days back and subsequently we registered a case,” he said. With majority of “violators” having good connections in the political circles, bureaucracy or the police, controlling these violations seems to be a daunting task for the traffic police. People wait in queues to paste black films on windowpanes of their cars and SUVs on Court Road and Queens Road, where the majority of shops of spare parts are located. As far as traffic norms are concerned, use of dark, black or reflective glasses in vehicles are banned. The Central Motor Vehicle Rules say the glass of windscreen and rear window of vehicles should have a visibility of at least 70 per cent and in case of side windows, there should be a minimum visibility of 50 per cent. These violations also threaten city’s security. “As the police hardly checks these vehicles, these vehicles can be easily used for ferrying narcotic substances. The police should know that drug addiction and peddling are rampant in this border region,” said Rajneesh Sharma, a resident of Chheharta area. Criminal elements could be easily identified if the vehicles have 100 per cent transparent glasses, he added. On the other hand, several residents said in summers the air conditioning system in the cars becomes inefficient if the glasses are fully transparent. Traffic policemen on the condition of anonymity expressed their inability to check these violators due to their high political connections. Interestingly, the traffic cops have got a lone luxometer to check the visibility of the windowpanes. “Whenever we try to challan these violators, they phone some politician or our superior,” the traffic policemen said. Karanjit Singh, ACP (traffic), denied any lapse on traffic police’s part. “Violators are often challaned,” he said. Shopkeepers on the road have extended their shops on the footpaths blocking the way for gurdwara visitors. A usual phenomenon in the markets across the city, cots stalked with clothes cover the footpaths. Due to large number of footfall in the gurdwara, traffic chaos is quite frequent on the road. Walking through this heavy rush of vehicles is highly unsafe for pedestrians. Gagandeep Singh, a resident, said, "In the mornings and evenings, when maximum numbers of pilgrims visit the place, traffic jams are a common thing. As footpaths are blocked, visitors have to walk on the road." He said if there are footpaths available, the problem of traffic chaos can be solved to a great extent. Even though there is a parking lot managed by the gurdwara, residents park their two wheelers on the roadside. A government employee, Harmanpal Singh said, "Considering the rush of pilgrims, the administration is required to take notice of the chaos." He said footpaths must be freed from encroachers so that pedestrians can have a hassle-free movement. Residents said encroachments on footpaths do not leave a nice impression on outsiders. "If Amritsar is to be made a tourist destination, we will have to learn these basic things. Nobody wants himself to be smashed by a vehicle while walking on the road," said Gurupkar Singh, a visitor from Ludhiana. "Perhaps there is some misconception. Almost every shopkeeper here has put some goods on footpaths to attract customers," said Navjeevan Singh. Thanks to the advancement in medical sciences, 19-year-old Satnam Singh does not have to keep silent anymore. From a farmer's family with limited resources, Satnam, whose voice sounded that of a female, had confined himself to his home for the past six years. Doctors at ENT department of the SGPC-run Shri Guru Ram Dass Medical College performed thyroplasty surgery on Satnam and gave him a new life. Now, Satnam Singh has got a masculine voice, which he always wished. Taunted at school, Satnam had left studies while he was in Class IX and confined himself to his residence in Khakh village in Tarn Taran..
Talking to The Tribune, he said, "People laughed at me. My parents did every thing to get the disorder cured. I even went for nose and ear surgeries as suggested by doctors. But now after thyroplasty surgery, I have got my confidence back." Head of Department Dr Baldev Singh claimed that thyroplasty surgery has been performed for the first time in the state. He said the facility is available at only four hospitals in the entire country. Dr Baldev Singh said, "The problem is found in one person out of every nine lakh people in India." On a lighter note, Dr Singh shared, "We had asked for his choice and he said he wants a voice similar to that of Amitabh Bachchan. Of course we cannot do that, but now he has got a voice that is impressive and masculine." The team of doctors also included Associate Professor Dr Vanita Sarin and senior resident Dr Jaskaran Singh. The surgery cost Rs 6,000 only. Dr Vanita Sarin said, "The surgery is advised only if the problem is not cured with the help of speech therapy." Dr Jaskaran said, "He was depressed to the extent that he seldom made any eye contact while speaking to others. And now he seems happier than ever." n Satnam Singh, who has voice resembling that of a female, had confined himself to his residence for the past six years. GND University won the overall championship trophy of the International Jhomer Festival held recently in Jaipur. 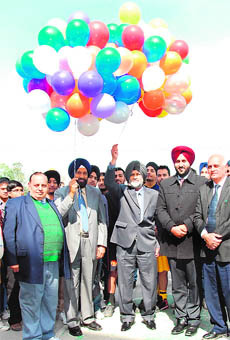 Dr Jagjit Kaur, director of youth welfare, said the university students participated in music theatre, dance, classical and fine arts during the festival. She said the university won the first prize in group folkdance, one act play, western group dance, mime, mehdhi and rangoli. The students bagged the second position in Indian folkdance, folksong, fancy dress, cartooning and mono act competitions. In the competition of classical song, classical music, on-the-spot painting and collage the university bagged the third position. She said the university also participated in inter-university cultural programme organised by Punjabi Academy, Delhi, at the Talkatora Indoor Stadium. Total seven universities from North India participated in this programme. The students of GND University secured first position in folk music, folksong and second position in Gidha dance. Prof AS Brar, vice chancellor of Guru Nanak Dev University, has been elected as the president of National Magnetic Resonance Society of India (NMRS) for a period of three years. He was elected during the NMRS national conference held recently at Bangalore. A university spokesman said as the president’s responsibility will be to enhance the magnetic resonance related activities throughout the world. The magnetic resonance includes magnetic resonance imaging (MRI) and the development of it, he added. The NMRS was established in 1995 with the aim of bringing together scientists who are working in the field of nuclear magnetic resonance, electron spin resonance and other fields. GND University is to honour its student who brought laurels to the university. The students won the north zone inter-university championship theatre trophies. A special function would be organised on March 6 in the Guru Nanak Bhawan Auditorium of the university. Dr Jagjit Kaur, director of youth welfare, said vice chancellor Prof AS Brar would give away the trophies and certificates to the students. This was decided in a meeting held today which was participated by the Punjab Students’ Union, Shaheed Bhagat Singh Naujwan Bharat Sabha, Janwadi Naujwan Sabha and Sarb Bharat Naujwan Sabha. The leaders said the administration has failed to save Dhingra’s house from being razed by land mafias. A few days ago, the students’ association held a protest demanding national heritage status for the Dhingra’s ancestral house and submitted a memorandum to Deputy Commissioner Rajat Aggarwal in this regard. While the entire world is celebrating Indian writers like Arvind Adiga, Chetan Bhagat, Rohinton Mistry and company, Punjab still awaits its next big name in English writers after Khushwant Singh. Does this mean the Punjabis have no heart for English writers? “Actually, no one has ever taken an initiative toward popularising English writing here,” said Parminderjit Singh, author and editor of Akhar magazine from the city. “Writers here are aloof from the English. It’s a choice rather than lack of knowledge. We have a strong regional influence and that makes Punjabi literature more popular, he added. However, he agreed that in last few years English writing has come up in a big way in India. “It’s time Amritsar too adds to its list of English writers,” he said. Call it a bitter truth but the young generation prefers the English more than any other languages. But Amritsar’s writers prefer to stick to the traditions and go with the vernacular prose. “English writing has never been in city’s literary culture and even readers are loyal to Punjabi verse. Though we have good writers like Khuswant Singh, most of our English literature comprises translated works by Punjabi authors,” said Tejinder Bawa, an author and poet from city. “English is no more a second language in India. We need to understand the change in mindset. The younger generation is welcoming the English writers like never before; their works are becoming bestsellers. We have to respect our vernacular literature but also need to accept the fact that English writing is commercially more successful toady,” said Dalbir Madaan, owner of One Up Library. “There are some upcoming NRI English writers and we are trying to get their work popular in the city. But the bonding between the readers and the authors has to happen and it will take time,” says Paramjit Singh, member of Naad Pargaas, a literary society. “Amritsar is very artistic in its appeal. My work is all about religious art and acrylic on paper,” says Praveen. The four-day exhibition, which began on Wednesday, has 10 paintings from each artist, a compilation of contemporary works with a regional touch. “Each of our works is different from each other as we belong to different parts of the country. 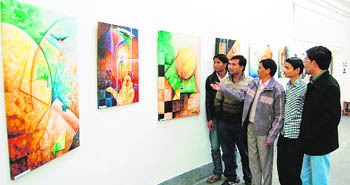 Our paintings have regional touch,” says Praveen. As for the response, they have started on a positive note. “We have received a lot of appreciation here and the footfall is also good. We have also interacted with the artists here and found a good support system,” says Debabrat. They are planning to hold their solo shows next year. The exhibition is on till February 26. Those arrested are Ravi Kumar of Sadar Bazaar and Sonu Bihari of Naraingarh area. Meanwhile, three others, identified as Money, Jeet and Jasbir Singh, all residents of Sadar Bazaar, managed to dodge the police. A case under relevant sections of the IPC and Arms Act has been registered. Acting on a tip-off, the police conducted a raid on vacant residential plots near Polytechnic College and arrested the two.